It’s around this time of year that I re-acquaint myself with a familiar sequence of events: an initial period of doubt as to whether it’s all really worth it, then a sense of relief as the day passes off without incident, and finally a degree of satisfaction that maybe it wasn’t such a bad idea after all. Yes, you’ve guessed it: another chapter inSearch Solutions history has just concluded. For those unfamiliar with Search Solutions, it is of course the IRSG’s main practitioner event, in which we invite influential leaders from the search industry to share ideas, innovations and insights with their peers in an informal, interactive setting. This is evidently a different formula to the more established search industry conferences, and a world apart from research-driven events such as ECIR. But in its own modest way, it seems to work. After the break Martin White shared with us his insights into the people-related challenges of deploying commercial enterprise search solutions, drawing on the findings of a survey commissioned by the European Commission. 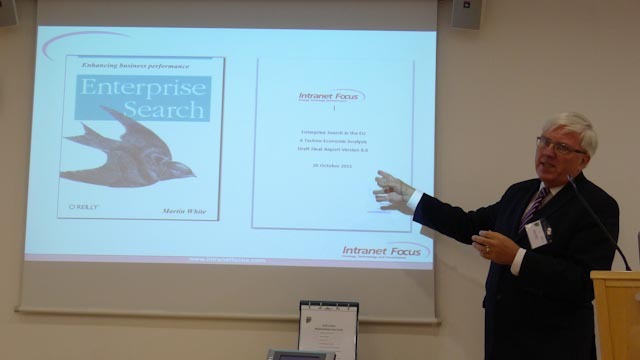 This theme was continued by Kristian Norling, who used the results of Findwise’s Enterprise Search Survey to examine the characteristics of successful enterprise search implementations, and what best practice implications that might suggest. The session was completed by Emma Bayne who shared her insights into the challenges of providing a universal search interface to the 20 million records in The National Archives, and the role that taxonomies, personas and user-centred design plays in that process. After lunch Stella Dextre Clarke presented an insider’s view of the role of standards in thesaurus development and the value of controlled vocabularies in information retrieval. This was followed by Leo Sauermann, who shared with us the ups and downs involved in growing a semantic web business from its origins in EU research to a community project and beyond. The session was concluded by Charlie Hull, who showed us some of the things that can be achieved (such as media monitoring tools and document classifiers) using open source software and an open mind. In the final session Nicholas Kemp presented the DSTL view on technology landscaping, and how search (in its broadest sense) is used to deliver a horizon scanning service to the UK defence and security community. And finally Richard Morgan concluded the presentations with a humorous and candid view into the delivery of professional services and the importance of providing end users with not just the tools but the motivation to take responsibility for the effectiveness of their own search application. We ended the day with a fishbowl session, in which the floor was opened up to review themes raised during the course of the day or to explore new topics. This flowed seamlessly into the drinks reception (no pun intended ), with the AGM concluding the formal proceedings. So that’s it for SS 2012. And what of next year? I’ll still be involved I suspect, but an event like this benefits from new ideas, and in that respect we actively welcome new faces on the organising committee. Moreover, some elements of the programme need a little further thought: the tutorial programme, for example, wasn’t as successful this year as we’d hoped. That might be because SS simply isn’t the right size or type of event to warrant its own tutorial day. OTOH it might be that this year we simply didn’t get the execution right. I’m hoping it’s the latter. But to really find out, we need someone to take this on and run with it. Is that someone YOU? Published at DZone with permission of Tony Russell-rose , DZone MVB. See the original article here.